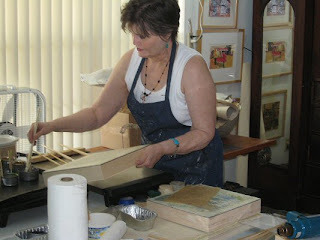 As I keep making more of these encaustic panel paintings, I keep thinking of how to store them in the studio. And how will they be taken care of and stored by galleries. I got out my Uline catalog and looked and looked. 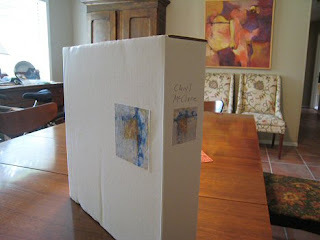 Finally, I went to their site and just plugged in 13 x 13 x 3″ in the corrugated cardboard category and came up with what I thought would be a good solution. These are called “literary mailers” and resemble a good, heavy pizza box but with the 3″ depth. 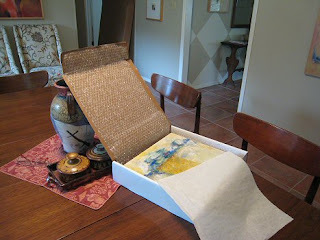 Taking advice from Joanne Mattera’s wonderful encaustic book, I have lined the boxes with small bubble wrap and put a piece of glassine on the top of the panel. I also printed out an image onto light weight poster sheet I had in the office…and a small image for the spine in case they are held in the gallery storage this way………voila! I think this will do to protect the panel and also make it easy for me or the gallery people to pull this work when not hanging on the wall. I can also pack this up with extra bubble and enclose in a larger box for shipping when necessary. 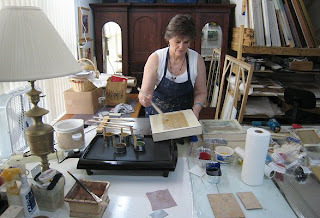 Now….somewhere on the internet, or in a book, I found a statement an artist printed out to put on the back of their encaustic paintings…..hum, now where is it? I need something similar edited to fit my work. Hope I don’t have to just go and re-invent the wheel on this. Image Are We There Yet? I almost forgot to take a picture of the encaustic collage I mentioned last night. I could change it a little…like scraping back into some of the map type. BUT, probably not as I prefer people to make their own stories up about the work. I think this is gonna have to be the title of the next encaustic. Who knows where these ideas come from? Anyway, I was working on the last two panels and applying collage elements Saturday when Curry took the last pictures. I still had to figure out the problems with the first ones. And I think I have….I applied too much heat with the apprehension that my elements wouldn’t stick down and not really having any experience with fusing. Now I know it works better to just lightly heat the surface, place elements, then apply a lot of medium, fuse lightly and just let it dry. Then you can scrape back when you want to see more of the collage pieces and leave the rest buried. Or that’s the way it’s working perfectly for the pieces I’m working on right now. Back to the title stuff………..my daughter and her boyfriend came by to see her dad on Father’s Day and they looked around my studio. 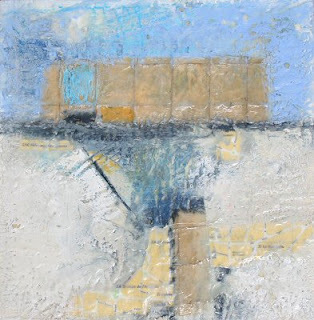 He’s a pilot…and is going to fly me out to PineTop AZ for my next show at the Joyous Lake Gallery in August. So he said, he’d luuuve to have a wax painting. (I did a really nice collage for him when he flew me to Santa Fe a couple of years ago.) Anyway, after they left it dawned on me that the collage element in the painting needed lots of work and I set to adding a few pieces here and there from some maps from a trip to France. ……….Lo and behold, I looked at it and suddenly the original element of a rice paper with threads running through it looked just like all those big glass windows in so many airport terminals……..heck some of my mark making could have been interpreted at runways (lets don’t get too carried away here) and then with the map that I suddenly realized pointed to the Salvaza airport,….You can see why that title just had to be. Now if it wasn’t so dark I would take a picture……….tomorrow I will although I covered up a lot of the map elements and it may be hard to be except in person. 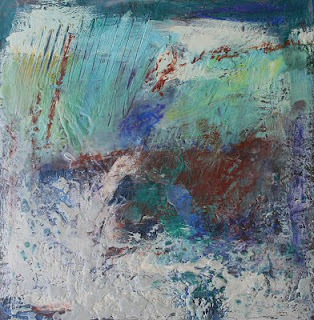 I worked some more on the latest encaustic from yesterday….I think it’s working better for me, both design wise and surface wise. Before it needed a lot more wax build up. As I do that, the surface values and colors changes……..so just playing it by ear (no other way)..I applied more wax to the foreground areas, scraping and fusing. As I was holding it up to get a better perspective I noticed out of my peripheral vision, the other 7 pieces hanging on the easel wall. This one looks like it could be the micro view of the first one. Weird, huh!